It is no secret that I am a food obsessive. It is equally known among those who love me that I always have been and always will be fixated on all things Asian. And as a blogger, I am motivated largely by the desire to educate and empower people in the kitchen. I live to show people that they can make foods that they’ve previously thought were too difficult to make in home kitchens or show them they can turn out foods worthy of their favourite restaurants. Today, I am thrilled to present the ubiquitous dim sum offering Bao Buns. You may -like me- have wanted to make Bao Buns for ages, or you may never have heard of them. 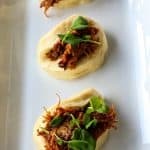 These pillowy, soft, tender, steamed buns are often filled with pork belly, grilled chicken, or other tasty little braised meaty bits. I think you’re going to be shocked at just how easy festive, fabulous classic Bao buns are to make in your own kitchen. 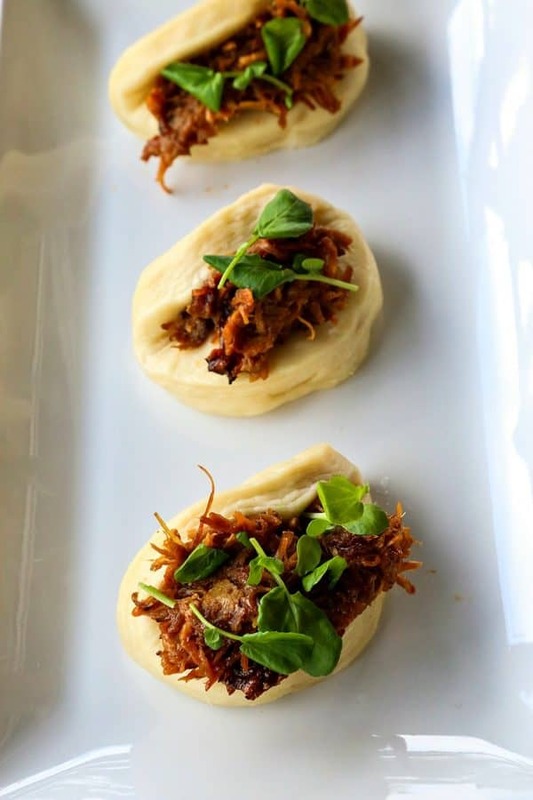 To see the invaluable step-by-step video tutorial on How to Make Bao Buns by superstar chef Mark O’Leary of Shojo Asian Bar & Bistro in Boston, Massachusetts, CLICK HERE! He makes the process completely unintimidating! This dough is about as easy as yeast doughs get. A gentle reminder, though: you will be greatly benefited if you measure your flour either by weight (included in the recipe below) or if you use the scoop-and-level method where you use a spoon to scoop the flour, sprinkle over the measuring cup (without shaking the cup!) until full, then the flat edge of a butterknife or handle of the spoon to level the flour. I find it significantly faster and easier just to measure by weight. Chef O’Leary’s recipe specifies using cultured buttermilk. That is wonderful, to be sure. 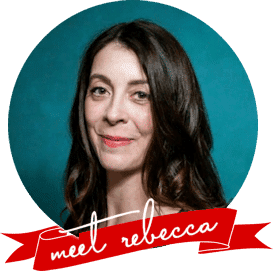 I can offer you a workable substitute if you find yourself in a situation similar to the one where I found myself when I realized I had used all of my buttermilk. Plain Greek yogurt substitutes admirably for buttermilk in terms both of texture and acidity. When you roll out your dough, take care not to roll it too thin. Anything under 1/2-inch in thickness will give you edible Bao Buns, but not the lofty, airy, pillowy ones you want! Please follow Chef O’Leary’s advice to cut your circles as closely together as possible and to rest the dough scraps before re-rolling them out. This minimizes the amount of “work” you have to do with the dough. The less you work the dough, the more tender you will make the Bao Buns. If you don’t have a proper wok steamer set-up, never fear! You can use a plain old, Walmart-available, stainless steel vegetable steamer and a deep sided pan with the same parchment square Chef O’Leary recommends. If you place three heat-safe ramekins upside down in the bottom of the pan and place the feet of the steamer on it, it will hold the buns off of the surface of the pan as needed and allow the steam to circulate around the Bao Buns cooking them evenly. Be sure your lid fits on the pan but allows room for the buns to expand in the steam AND allows a little steam to vent from one side! The easiest way to do this is to leave the lid a little offset on the top. Don’t make it fit tightly into place. 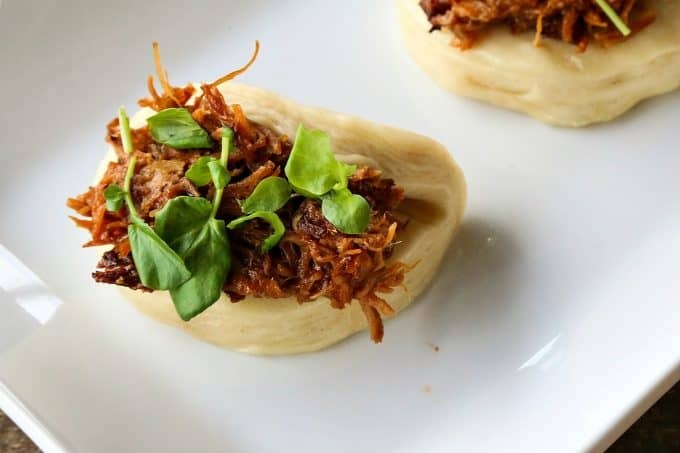 You can fill the Bao Buns with whatever floats your boat, but my personal favourite is pictured above: shredded pork tossed with Korean barbecue sauce and topped with a few sprigs of watercress, a little kimchi, some pickled vegetables, or thin cucumber slices. This is about as simple an appetizer or game day food as you can make, but packs some seriously impressive punch both flavour and texture wise! Add the flour into the bowl of a stand mixer fitted with a dough hook, or into a large mixing bowl. Whisk the sugar, baking powder, kosher salt, and instant yeast into the flour until evenly distributed. In a separate bowl, whisk together the warm water and buttermilk or Greek yogurt. Pour into the dry mixture and mix on low speed (or with a sturdy wooden spoon) until a shaggy dough forms. If using the stand mixer, bump the speed up one level and knead with the dough hook until a smooth dough forms, about 5 minutes. If mixing by hand, turn onto a lightly floured surface and knead until a smooth dough forms. If kneading by stand mixer, you can simply remove the dough hook and cover with a towel. If kneading by hand, lightly flour a clean bowl and place the dough in the bowl before covering with a towel. Either way, let rest in a warm, draft-free place for 30 to 45 minutes. 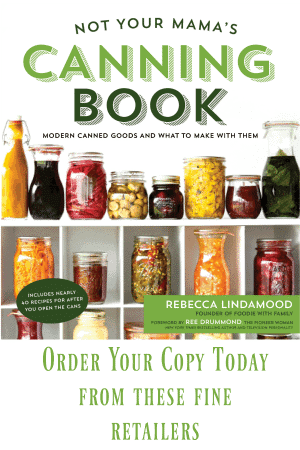 While the dough rests, assemble a wok or frying pan with a stacked steamer or place a stainless steel vegetable steamer in a pot that has walls that are at least 5-inches high. Whichever pot you use, you want about an inch of water in the bottom, or enough to boil for a while without bubbling up through the bottom of the steamer. You need some space between the water and your bao buns. Liberally flour a counter or dough mat. Turn the dough onto the mat and dust the top of the dough with more flour. Place your rolling pin in the center of the dough, and roll away from yourself. Lift the rolling pin, bring back to the center and roll toward yourself. Turn the rolling pin perpendicular to yourself, place in the center and roll toward the right. Lift the rolling pin, replace in the center and roll toward the left. 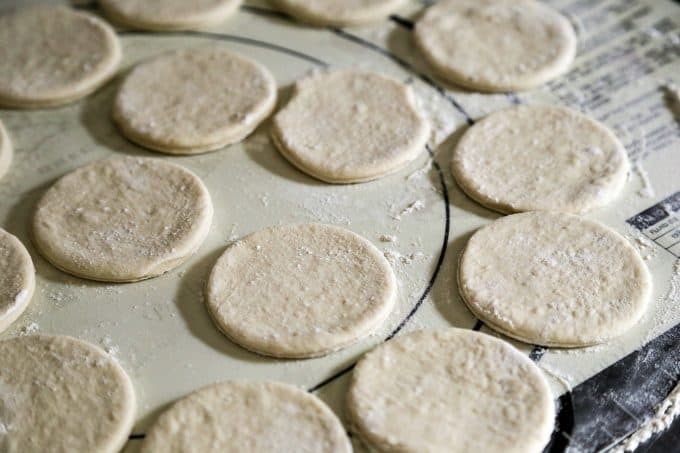 Take a moment to shimmy the dough around to be sure it isn't sticking, then repeat the rolling instructions above until the dough is 1/2-inch thick evenly. Dip a round cookie cutter in extra flour and press straight down into the dough. When you reach the bottom, give it a little twist to be sure it has cut cleanly. Lift the cutter, dip in the excess flour and repeat, making the circles as close together as possible to leave as little unused dough between the rounds as you can. When you have cut as many circles as possible, lift the extra dough away, press together, and return the extra dough to the bowl, covering again with a towel and letting rest 30 minutes before re-rolling and cutting more circles from it. Use the back of a spoon or pastry brush dipped in canola or sunflower oil to coat half of each round. Gently fold the un-coated half over the coated half of the round of dough. Place a rectangle of parchment coated with non-stick cooking spray in the steamer. Gently ease the folded buns onto the parchment, leaving 1/2-inch of open space around the perimeter of each bun. Place the lid on the steamer (or leave the pot lid slightly askew to allow the steam to vent) and let the buns steam for 6 minutes. Carefully transfer the finished Bao Buns to a plate and repeat with the remaining bun semi-circles. Fill the cooked Bao Buns as desired and serve within an hour of being steamed, but preferably while they are still warm. Oh my!!! These look de-vine!!!! That they are!!! You should give them a whirl! This recipe makes it sound so simple. I’m looking forward to trying it. Do you think this would be good with some shredded teriyaki chicken? I think that sounds like it would be divine!